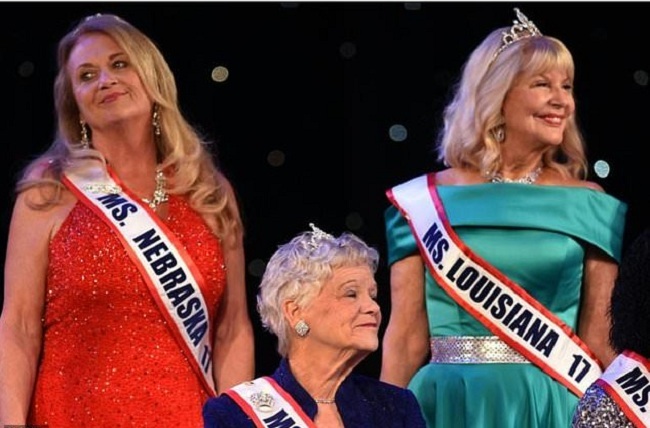 Ms. New Jersey Carolyn Slade Harden is crowned Ms. Senior America during the 38th Annual National Ms. Senior America 2017 Pageant at the Resorts Casino Hotel in Atlantic City, New Jersey, October 19, 2017. Atlantic City (United States) - Beauty pageants may conjure up images of young women in bikinis, but in Atlantic City a roomful of sequined grandmothers and great-grandmothers are putting their best stiletto forward. From an ex-CIA employee to Whitney Houston's childhood choir director to a marathon runner, Ms Senior America celebrates women aged 60 and above who defy stereotypes of what it means to be ladies of a certain age who in past years may have sunk into a rocking chair. "This is our age of elegance. It's the beginning. Not our end," beamed 73-year-old Carolyn Slade Harden, a former recording artist crowned Ms Senior America 2017, resplendent in cream silk. 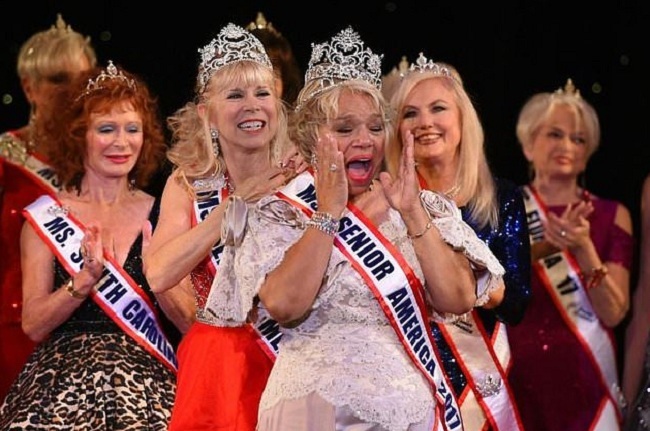 With some members in their 90s, Ms Senior America is a family of sisters who have experienced not just the pleasures of life but the pains -- surviving cancer, going through divorce, losing husbands. But if Ms Minnesota needed crutches to get on stage, Thursday's finals showed no one is ever too old to tap dance, sing or show off their curves in a sequined gown with a crown glittering on coiffed hair. Senior America Inc. was founded in 1971 "to promote the positive aspects of aging" and has championed women in their "age of elegance" ever since. There were 47.8 million people aged 65 and over in the United States in 2015, or 15 percent of the population -- a number projected to rise to 98.2 million, or nearly one in four residents by 2060. Glittering in strapless gowns, mermaid dresses and princess frocks, state finalists from across the country flashed winning smiles, bedecked in a haze of sequins, hair spray and immaculate make-up. "That's our mama!" yelled one man in the crowd as Ms Florida took the microphone. "I've never seen so many rhinestones in my life," confided another. Judging spans four categories: an interview, 35-second "philosophy of life" nuggets -- for example "let's all be the reason someone smiles today" -- evening gown and a talent. It was the talent segment that elicited the biggest wolf whistles from adoring friends and family in a hotel theater in southern New Jersey. Ms Tennessee danced ballet, complete with pirouettes and arabesques to Irving Berlin's "God Bless America." Ms Massachusetts dressed up in a can-can skirt to sing "Jumbo Italiano," while Ms Virginia donned a Julie Andrews-style Alpine costume to perform from the Sound of Music. Then there were the guest dance troupes: ladies in pink hats jiving to Shania Twain "Man! I Feel Like A Woman" and seniors doing hip-hop in blonde wigs and black leggings to Bruno Mars' Uptown Funk. "I love it! I love it!" yelled one man at the back. "Hollywood thinks youth," purrs Ms Senior District of Columbia Frances Curtis Johnson, 68, a community activist and executive assistant, who has no intention of retiring until at least 70. "They need to look at the beauty of growing old. To live is to get older, and we should take that and use it and embrace it." Ultimately it was Ms Senior New Jersey with a mega-watt smile and enviable skin, who carried the day, buoyed by a home-state crowd two years after the death of her husband of 51 years. In the gym every morning at 7 am, Slade Harden said there was no magic answer to looking fabulous in your 40s. "Pray, eat healthy," she said. Mother of two, grandmother of three and great grandmother of one, she was a recording artist in the 1960s, knew Dionne Warwick, directed a young Whitney Houston, got two degrees and set up her own company. "I think the word pageant scares some people away because they say 'oh no it's a beauty pageant' but it's much, much more than that," she told AFP. "It's beauty from within." For some contestants pageants have been a life-long obsession. For others, such as 61-year-old Ms Oregon, Diane Hennacy Powell, a practicing neuro psychiatrist and PTSD expert, it's new. "People tell me I look like Cinderella," she smiles. "I never really thought of myself as being pretty," she said. "You can have it all!" Ms Senior America 2017's ambition? Slade Harden says she wants to put the pageant on the map and do more to help local communities. But when it comes to her crown, her family has just one ask. "My kids tell me mom please don't wear it to the supermarket," she laughs. Beauty pageants may conjure up images of young women in bikinis, but in Atlantic City a roomful of sequined grandmothers and great-grandmothers are putting their best stiletto forward.